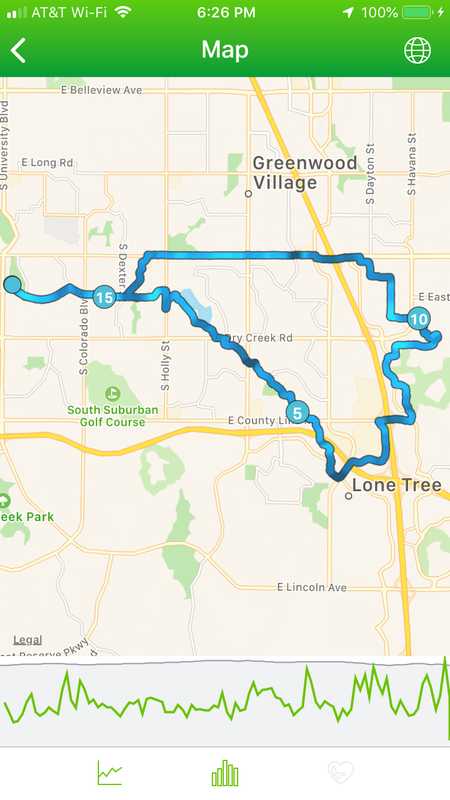 I headed Northwest, and found a trail I didn't know existed. I think it may go all the way to Confluence Park, and I'm dying to try it on one of these upcoming days I have off. Hopefully I'll be back soon, as I couldn't go as far as I wanted with my pesky job demanding that I show up. It was a cold morning, but nothing too terrible, and the excitement of discovery kept me pushing on. I had one of those rare moments when I found myself in an area and didn't really know where I was. That happens SO rarely for me these days. I mean, I had a vague idea, but when I took the picture that is posted above, I was fairly uncertain just exactly where I had pedaled myself to. It was Thanksgiving morning, and we had an appointment the very next day at the Vet's office to euthanize my favorite dog of all time. So, it's safe to say that although it was my favorite holiday, I was a little bit down. 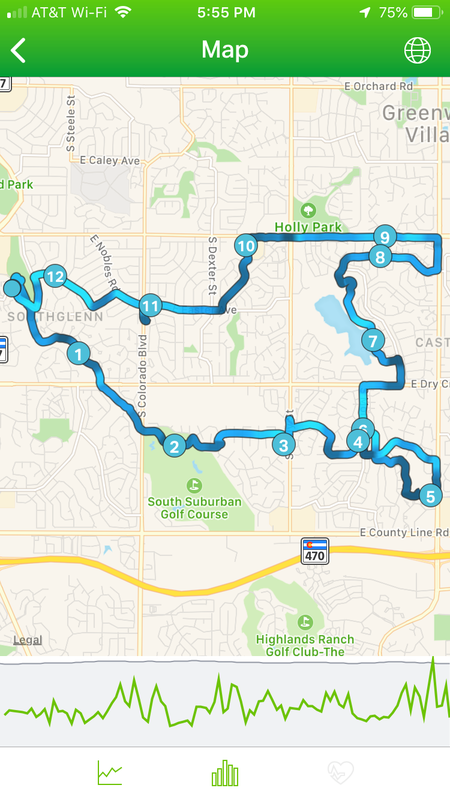 I decided to take a relaxed ride around Southglenn after going pretty hard on my previous two rides. My choice of podcast for this particular ride was uncanny. I have listened to the After Disaster for years, and one of the guys on the show spent pretty much the whole episode talking about how he had put his dog to sleep in the past week. He loved his dog a tremendous amount, and it would have been pretty sad to listen to regardless of my situation, but seeing as how I was mere hours away from facing the same thing, it hit me pretty hard. There were a few tears shed while listening, and I can't say that this was much of a workout for anything other than my emotions. When I got home, I found my dog wrapped up in a blanket on the recliner. She was just as happy as could be. It made me smile a melancholy smile, so I took a picture. I miss that dog. 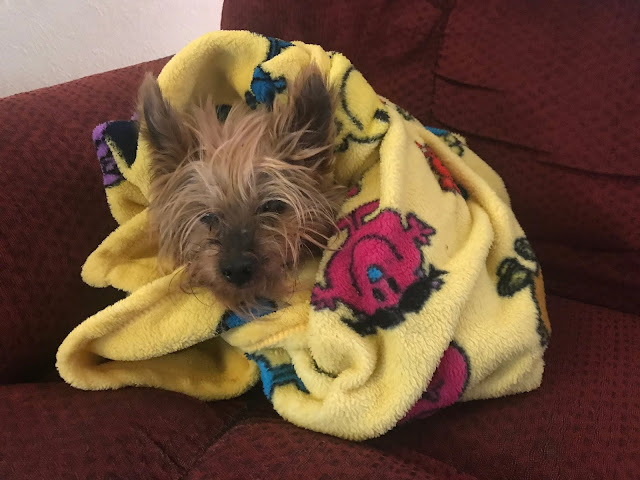 She was old, and she was blind, deaf, and more than a little senile and she had trouble pooping in appropriate places, but I still loved her and while it was certainly time to say goodbye, that doesn't make it any easier. 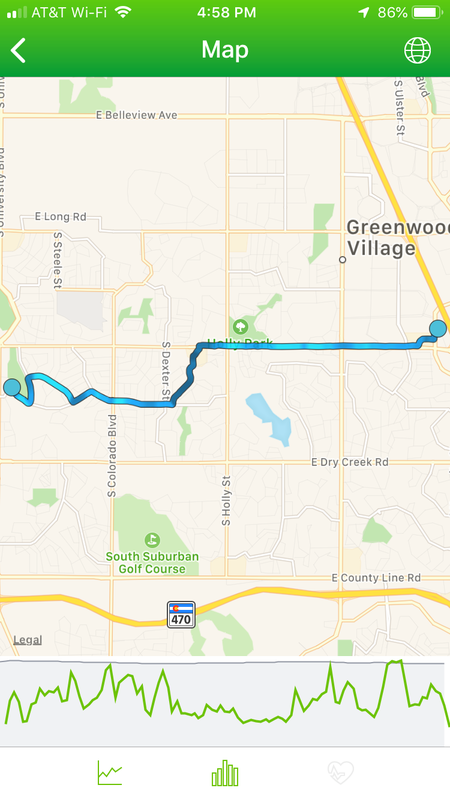 I went south to Highlands Ranch on this ride. That place is well named. 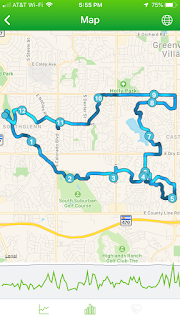 The "High" from Highlands Ranch comes from the fact that there are some massive hills there. I forget that anytime I go south, I am in for a tough workout, as there are some big inclines to power up. 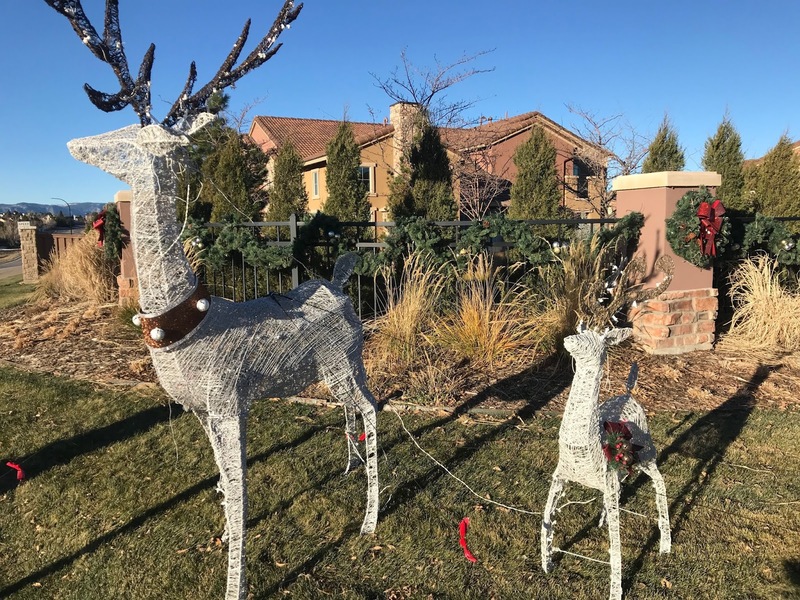 These reindeer look like they had just been set out the night before, maybe. Christmas is coming. (Even if this ride happened before Thanksgiving.) I'm looking forward to more Christmas decorations to take pictures of, hopefully there will be some extra goofy ones. We shall see. Mood: Time for a long one. I had the entire day off, so I didn't get started super early in the morning, but I still was determined to go a LOOONG way on this ride. 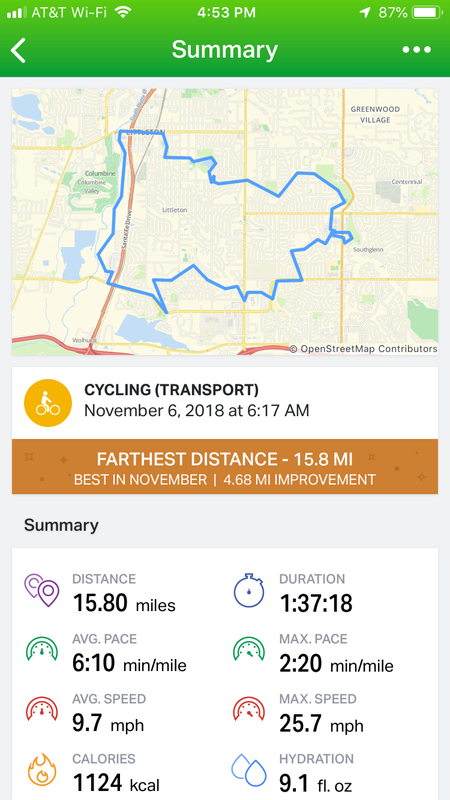 The weather was pretty nice, and I just knew that had a long ride in me. At one point, about halfway through, my wife called and asked where I was. When I told her that I was currently in Downtown Denver, I think it threw her. 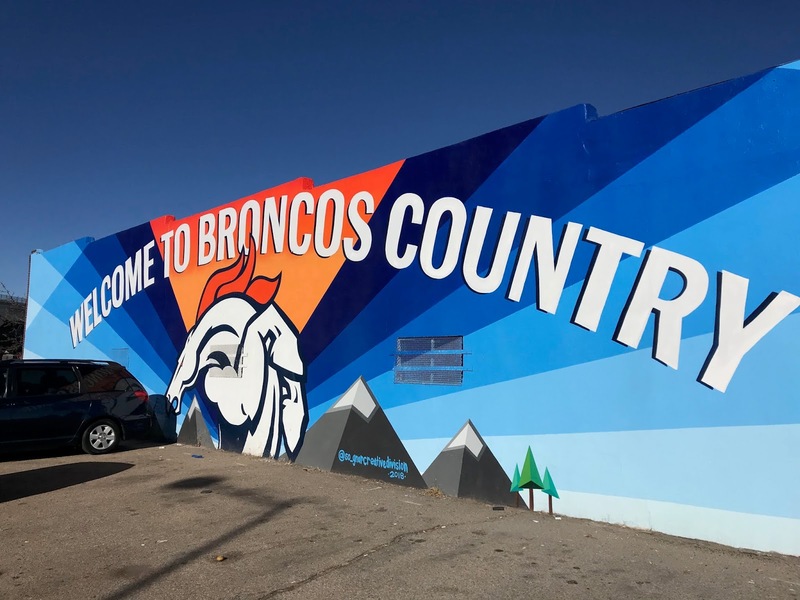 I saw a ton of cool stuff on the road, but my favorite picture was of this Broncos mural right near Broadway and I-25. I took this photo just in time, because almost immediately after I snapped it a large van pulled right into the spot blocking the Broncos logo. 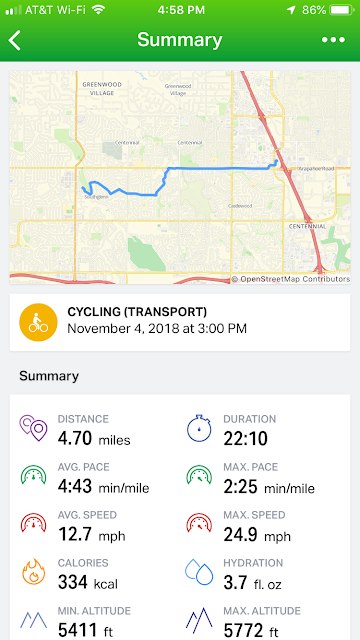 After finishing up this long ride, I didn't take it easy, however, as my son and a couple of his friends decided that we needed go down to the park and play Ultimate Frisbee. Needless to say, I slept very well on this particular evening. Mood: Hazing coyotes and playing in mud. Soundtrack: Everything is Alive / Middle Brother "Middle Brother" / Mumford & Sons "Wilder Mind"
The temps were in the 40s, and although there was still a decent amount of snow and ice, I felt comfortable hitting the road on my bike this Thursday morning. So it was with a sense of excitement that I left the house. 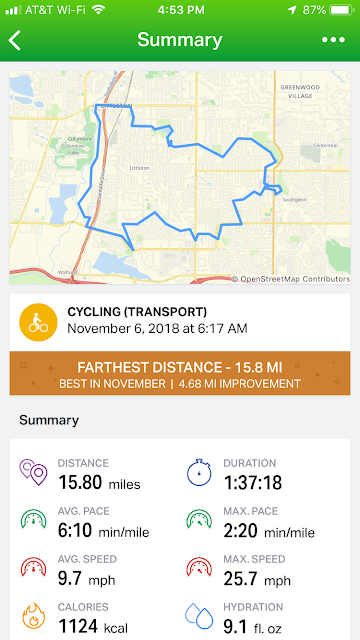 I started heading east, and within the first minute of my ride I saw a coyote running across a street that is very near my house. I heard somewhere that in order to keep coyotes from becoming too acclimated to an area, if you see one you should try and haze it with loud noises. Whether or not this is true, I began yelping like a psychotic cowboy at the coyote, and it definitely got scared. It bolted away into the trees like it was running from Satan himself. I felt kind of proud, plus it's fun to yell at coyotes...you should really try it if you get a chance. I bounded through a huge pile of mud, and I remembered something I hadn't thought about in decades. When your bike tires have mud on them, that mud slings off into the air in a most hilarious and messy way when you're riding. For the next twenty minutes or so, I was amused by large chunks of mud soaring into the atmosphere. Good times. 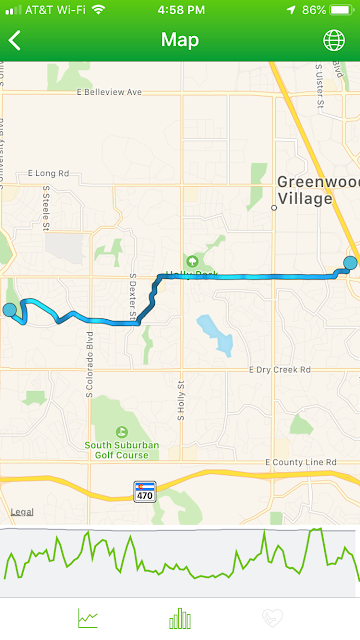 Weirdly, I never shifted the big gears into either 1 or 3 this whole ride, but just stayed on 2 the whole time. Not sure why I did that. Soundtrack: Jack Garratt "Phase" / Twenty One Pilots "Trench"
I would have preferred to ride my bike to running on this particular chilly Tuesday morning, but a lot of snow had fallen the day before, and there was still far too many icy patches for me to feel comfortable on two wheels, so I decided to lace up the running shoes and give it the old college try. My heel has been bothering me for quite awhile now. 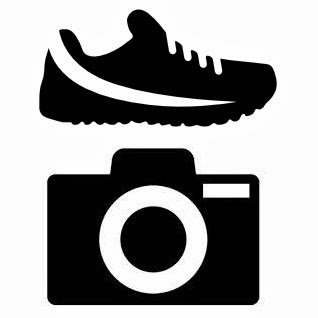 It's hard to explain it exactly, because it doesn't exactly hurt while I'm running, but I notice it. I also cannot run fast (or at least fast by my standards) with it. 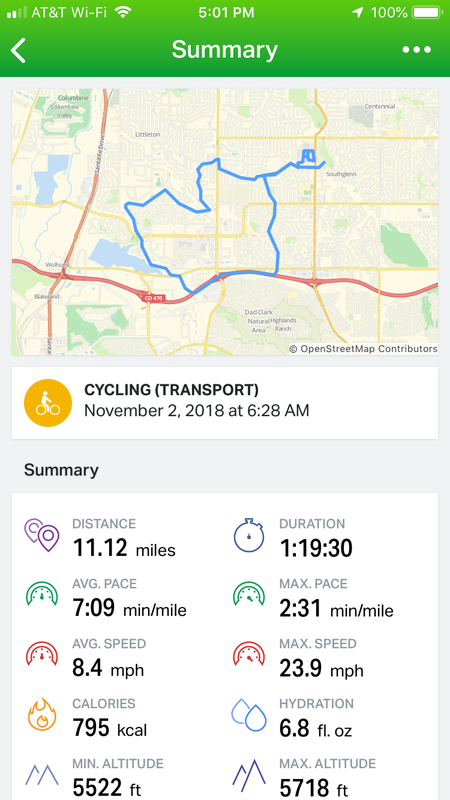 It's very frustrating, and so I have been using the bike for exercise to give it rest. I was worried that running on it might set back any healing progress, but I also didn't want to not exercise on this particular morning. 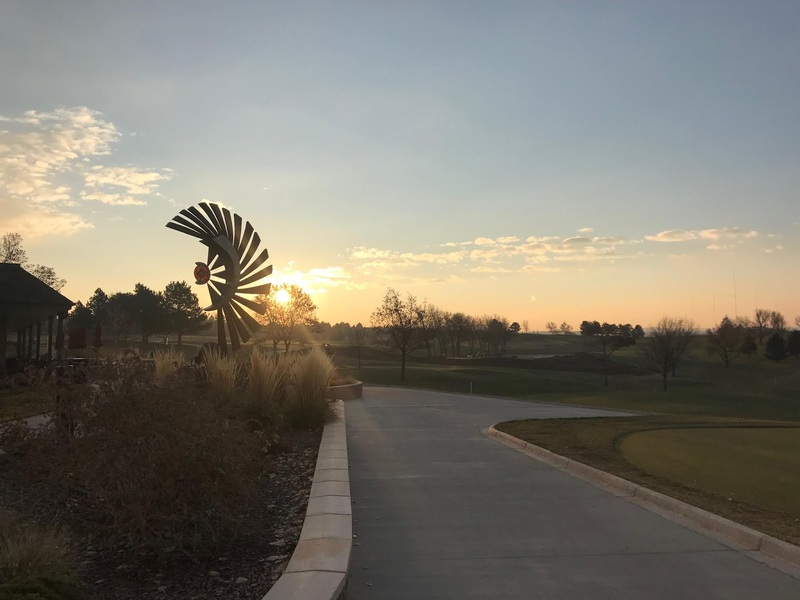 So it was reluctantly that I headed out into a frost filled morning (with a beautiful sunrise) to see how it'd respond. 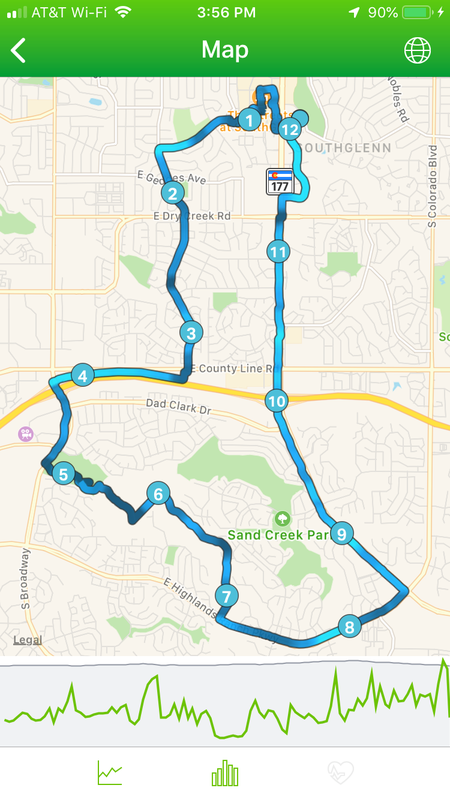 It was slow going, I felt winded way too quickly, and I didn't even manage four miles. So it was less than ideal, but my heel didn't feel any worse at the end than it had at the beginning and I got some miles in, so it was a guarded success. 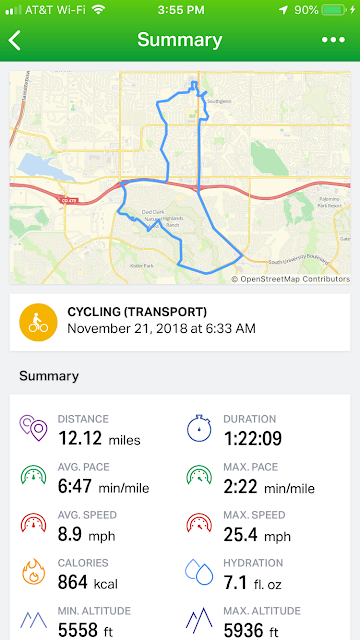 On the plus side, my feet were not frozen when I arrived home, which is a common problem on freezing mornings on the bike. I can't decide if I'm transforming into a biker or am still just a runner rehabbing a sore foot. There are definite things I like about biking. The numbers are higher! 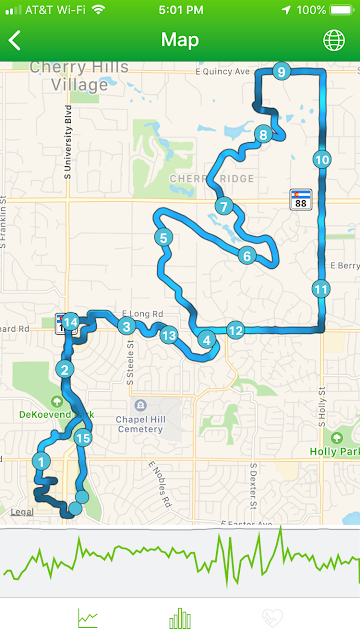 It's much more fun to say you did 12.61 miles of something than 7.1 miles of something, even if the running of the shorter distance is much tougher than the biking of the longer distance. It feels more impressive. In addition to being able to say you put in more miles, you actually travel more miles, so you can go further and see more things. The radius of places I can travel to and then back from on a morning stint is about twice as large. Also nice about biking...I don't get as sweaty. Perhaps I'm not actually getting as much exercise too, but being less sweaty at the end of a workout is nice. 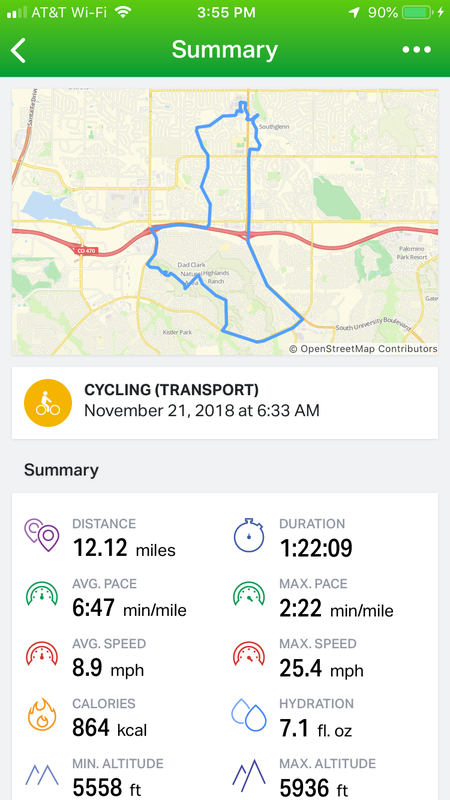 The things I don't like as much: My feet get so cold on my bike. 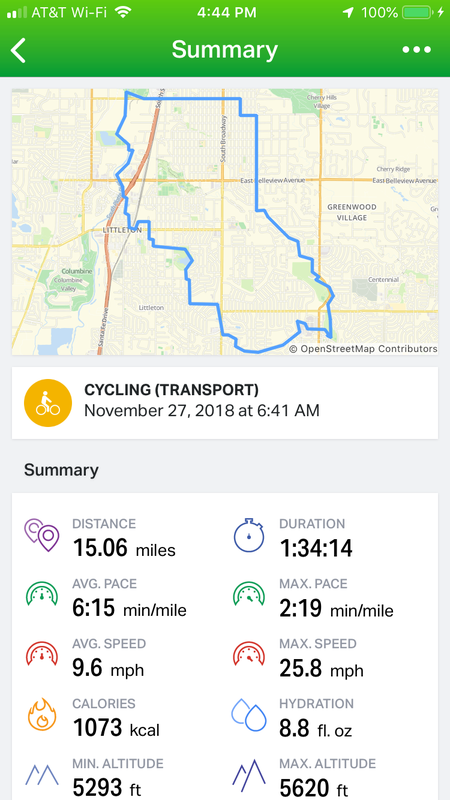 When I'm running, the constant plodding on the ground tends to keep my feet warm and toasty, but when those toes are sitting lazily upon the pedals, they tend to form into solid blocks of ice. When I was walking back into the house this morning, it felt like my feet had just solidified into large ambiguous frozen clumps at the bottom of my legs, most unpleasurable. Also when I'm on my bike, I feel less free to stop into a business while working out. 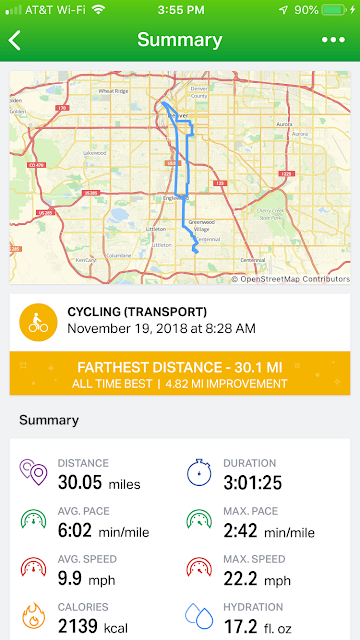 I can still do it, but I have to leave my bike outside. This was fine when I was riding a 20 year old Wal-Mart bike that no one in their right mind would steal, but now, I am unwilling to risk my new expensive property by just leaving it outside for any random hoodlum to abscond with. 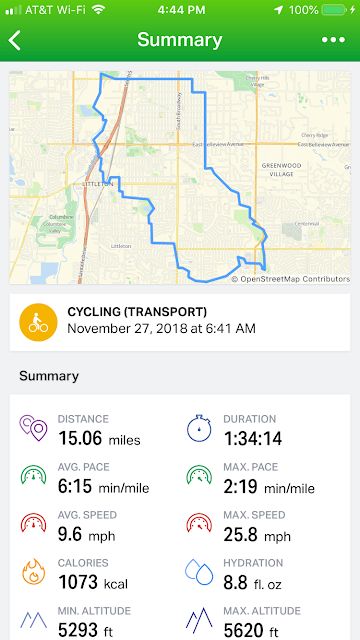 Probably I'm going to mix it with with both running and biking once my foot feels up to it, especially now that I've invested a sizable sum in a good bike. Mood: Happy to give the new bike it's first real spin. Soundtrack: This feature on hold, pending working earbuds. 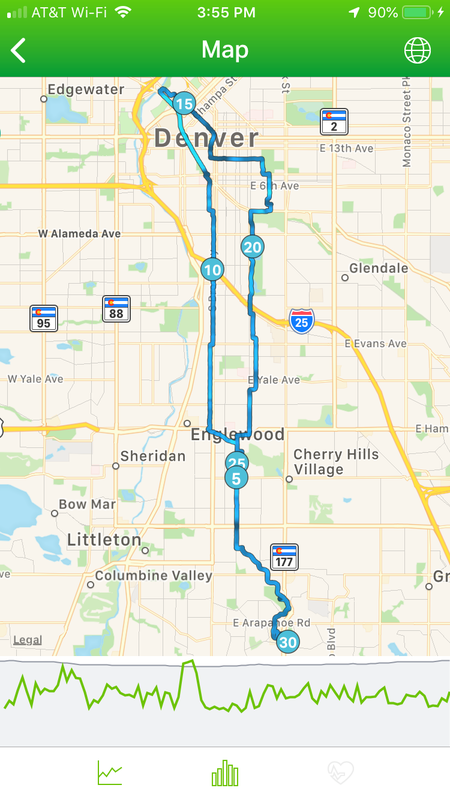 Even without music to accompany the trip, I took off in a tremendous mood on Tuesday morning, as it marked the first real occasion to take my new bike on a real honest to goodness ride that was more than just riding it home from the bike shop. 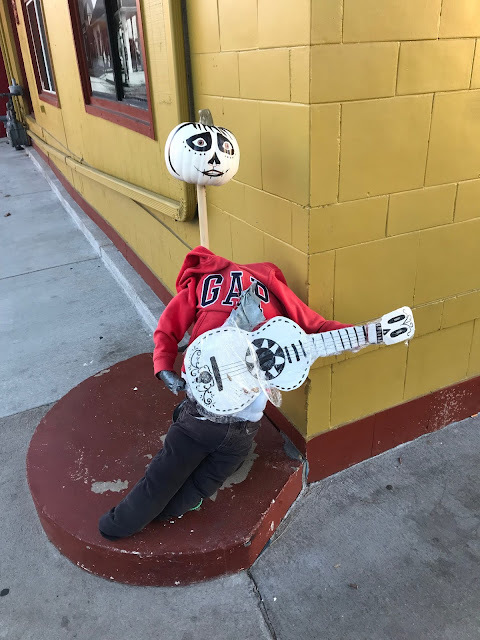 I decided to head west, and found myself in downtown Littleton where I saw this pumpkin which I think was supposed to be painted in the style of a sugar skull, but it was also attached to a stick which made it look like it was supposed to be a Mariachi, except that instead of wearing a traditional mariachi shirt, it was wearing a GAP hoodie, which seemed wrong. Anyway, there was a lot going on in this photo, so I had to share it. After Downtown Littleton, I rode for awhile along the Platte River, and then went past Carson Nature Center, to the Highline Canal Trail, to the Lee Gulch Trail, to home. 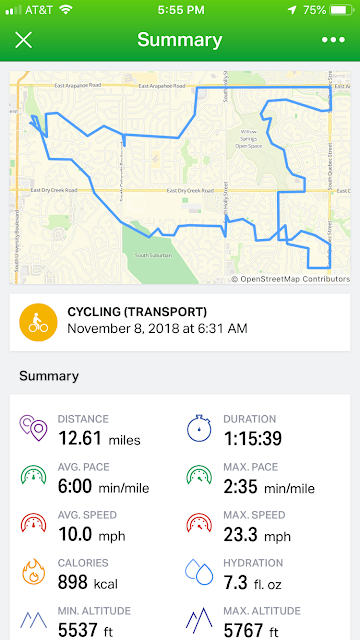 Having a bike that allows me to go faster and which is much easier to climb hills with was a godsend. It felt amazing to be unleashed with an honest to goodness good bike. I absolutely loved it! 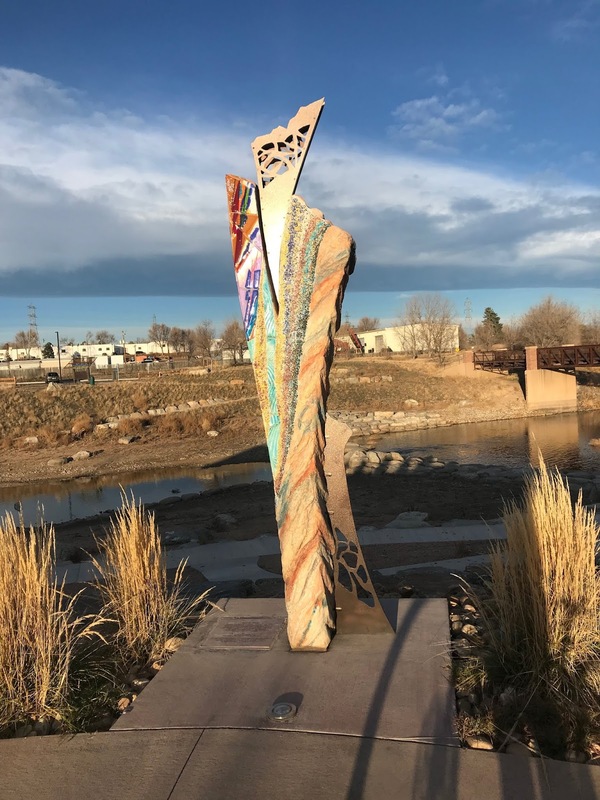 Soundtrack: The lovely street sounds of Arapahoe Road. My lack of passion for this particular Broncos season can be summed up with this one bit of news...my wife suggested that we go shop for a new bike for me right as they were about to kickoff, and I said, "Sure. Let's do it!" As I have been mentioning, my old bike (which is around 20 years old) has been breaking down lately to the point where I didn't feel comfortable riding it, so the suggestion to go get a new one was a very welcome one. If this were a normal Bronco season, however, I would have suggested we go at a different time. 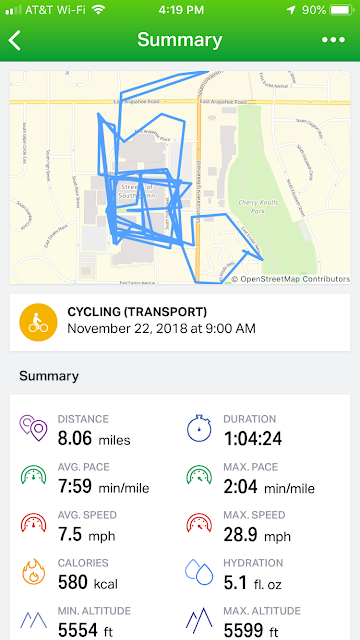 However, with this particular lackluster team being led by an extremely lackluster coach, I was indifferent about the idea of missing the first half, and very motivated to get a new bicycle. As you can see in the photo above, mission accomplished! 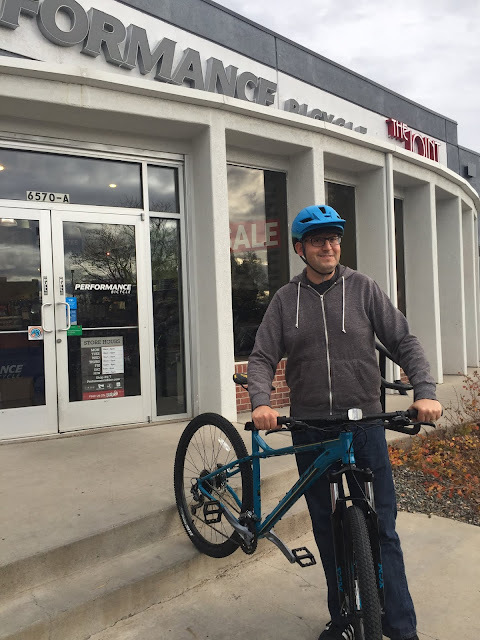 I purchased not only a bike, but also a helmet (which is a major development, as I've never really liked wearing a bike helmet), and a little bike cap to wear under my helmet to both keep my head warm and make sure the skin on my bald head doesn't get burnt by the sun. I decided that rather than loading the bike into our van, I'd also rather ride it nearly five miles home. It was mostly downhill, and though it meant that I missed even more of the game and also that I had to ride while in jeans, I was very excited to take the new bike out for a ride. 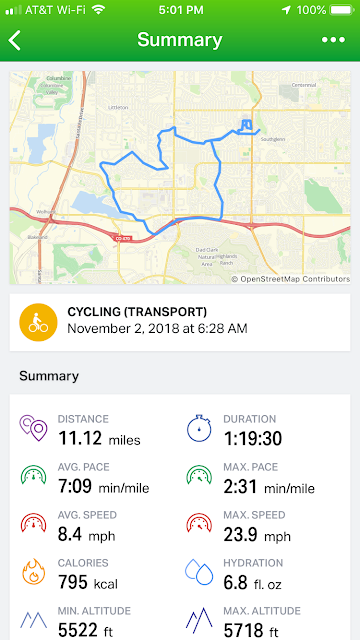 I could feel how tired my legs were from running seven miles that morning every time I had to ride uphill, but I was so pumped to have a new bike, I didn't even mind that much. 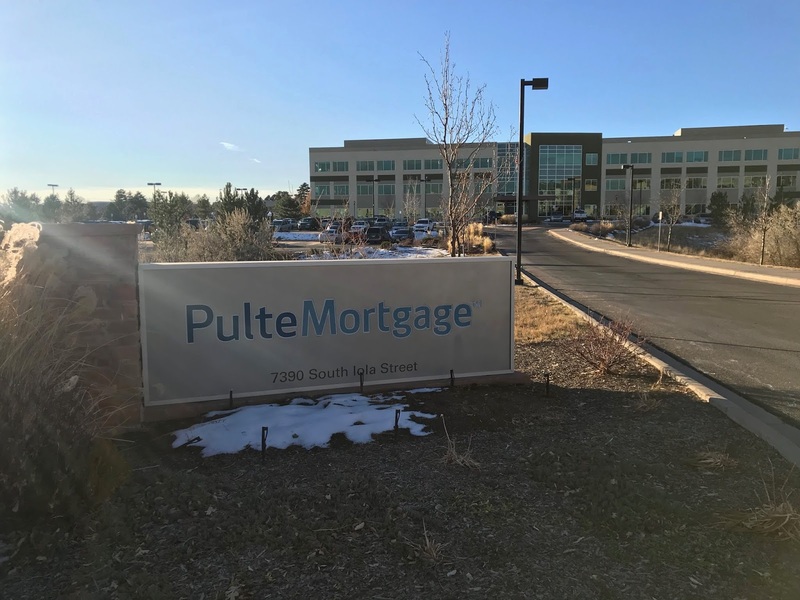 By the time I got home, I was able to see the final minute of the first half of the Broncos game. (In which coach Vance Joseph made a boneheaded decision which hurt the team, as per usual.) And I watched the entire second half as the Broncos ALMOST beat the Texans, and would have had a much better chance to do so if once again Vance Joseph didn't make yet another boneheaded decision. I'm happy to have a new bike, and hopefully after this football season ends, I'll be happy to have a new head football coach for my team. Mood: Glad I'm not trying this while pregnant. Man, it was a cold and gloomy Sunday morning. 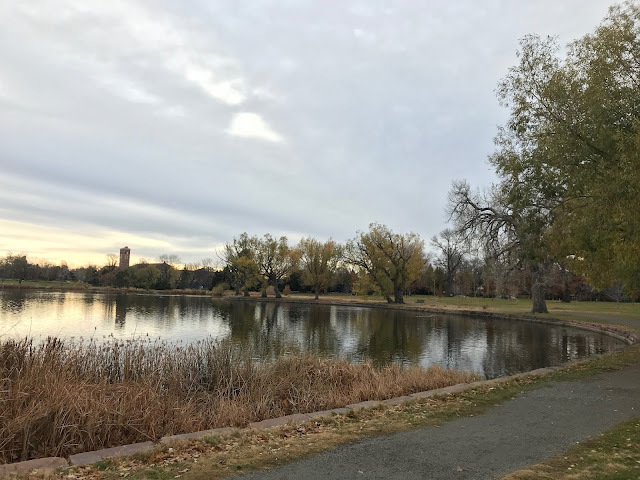 After a week of bike rides, I headed to Wash Park for a run because as I mentioned in my last post, I no longer trust it to actually work correctly. So although my heel isn't feeling 100%, it was feeling good enough to attempt a run. I wanted to get in some kind of exercise, and this was my best chance, so I made the best of it. 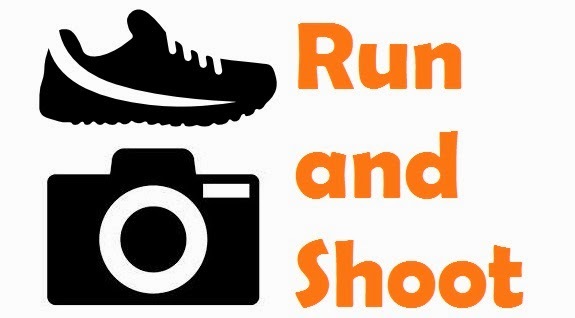 The run itself was pretty good, and on it I saw an extremely pregnant woman attempting to jog. This made me feel a little uneasy, as she looked quite uncomfortable, and I'm not sure if you should be out jogging on a cold Sunday morning during your final trimester, but there she was. 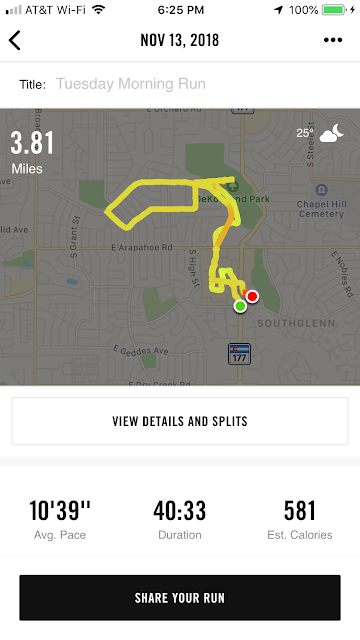 Her pace was quite slow, but man, she was doing her thing. 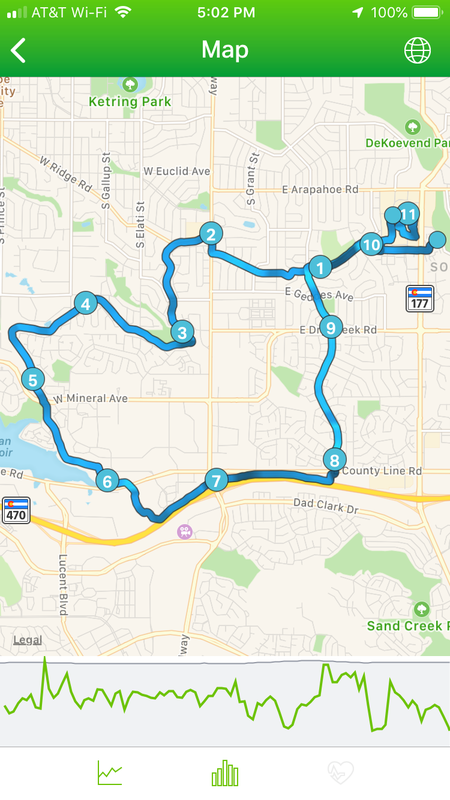 My foot held up pretty well, with minimal soreness at the end. 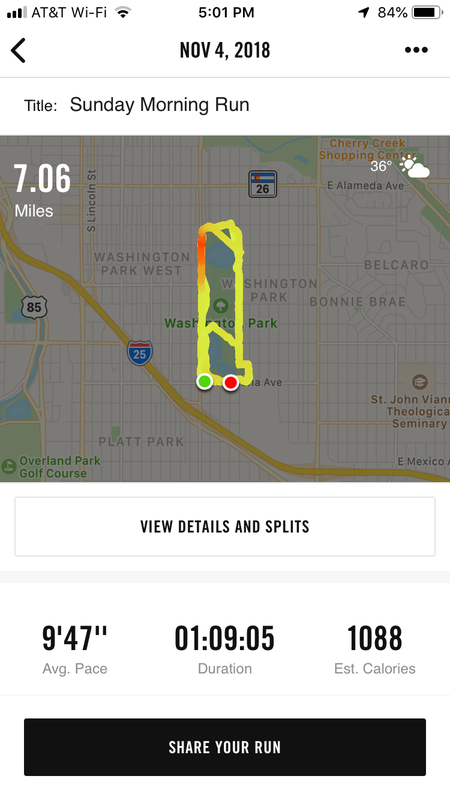 I pushed myself to try and get a full seven miles in, and that last half mile was a doozy, but I made it! 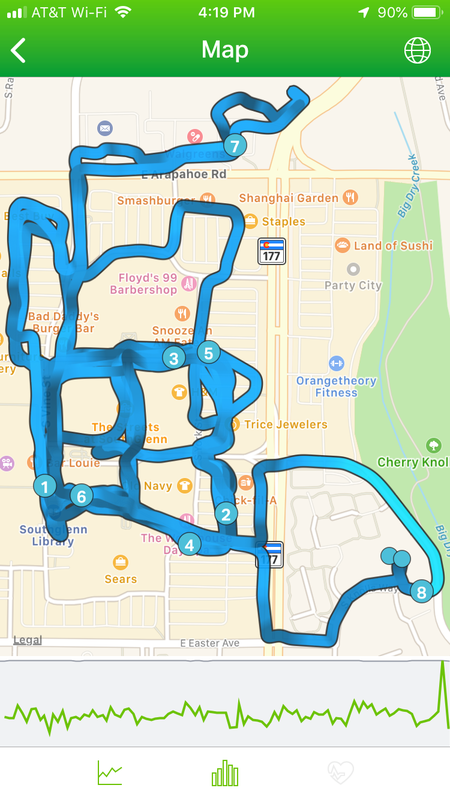 Annoyingly, my wireless earbuds did not make it, as they crapped out in the last few minutes of the run, and I have not been able get one of them to turn back on at all since, so I think they finally may have died permanently. I've known that they were nearing the end of their life cycle, and I even purchased a new pair on Amazon last week because they were not holding their charge very well, but I had rather hoped that they would survive until the new ones arrived. I believe they are being shipped from China, so who knows how long it'll be before I'm back in business with usable earbuds. Hopefully soon! Mood: Losing faith in my bicycle, but not in biking. Soundtrack: The Avett Brothers "Emotionalism" and "True Sadness"
I'm actually thankful that Daylight Savings is ending this weekend, as when I went for a ride this morning, it was super dark for quite awhile before the sun finally made an appearance. Falling back an hour will help this issue for at least a little while until the days get so short come December that we'll be back to this same issue for awhile. 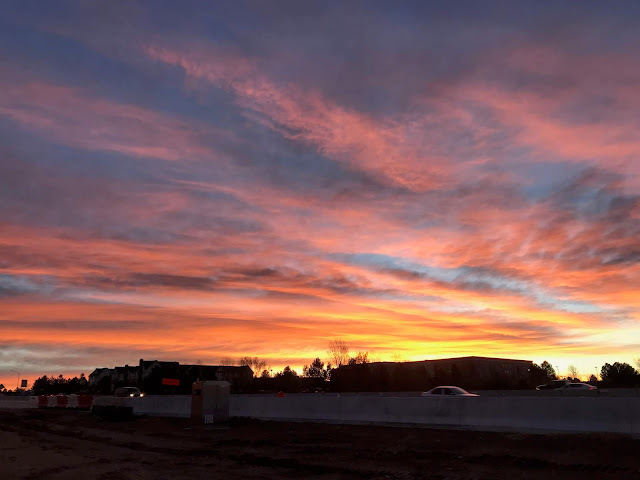 At least the delay allowed me to watch a very pretty sunrise come up over C-470. 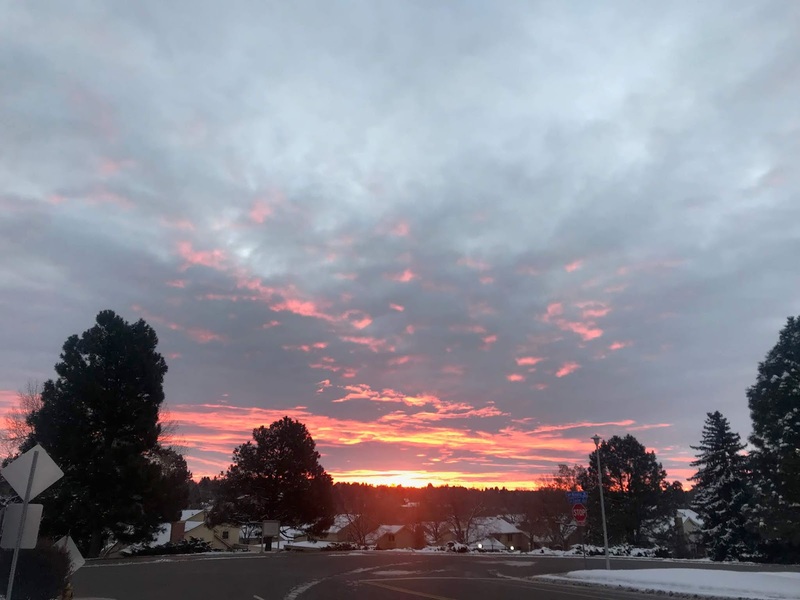 A highway isn't the ideal location to watch the sun come up, but it was still quite scenic this morning. I got a little bummed this ride, because I can no longer trust my trusty green bike. It has developed this nasty habit of occasionally allowing me to spin my pedals super quickly without actually providing any forward thrust. 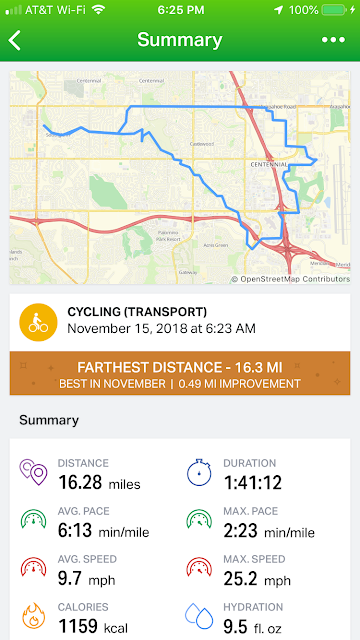 It's like whatever connects the pedals to the chain just stops working for a bit, and suddenly I have no ability to actually propel my bike forward. It first started doing this a tiny bit last week, but on this morning's ride there were four or five moments where it did this, and some lasted for five to eight minutes at a time. I am bummed, as I've been enjoying this break from running to let my foot rest a bit, but I don't feel like I can trust my bike, as I don't want to be ten miles from home and suddenly have a bike that won't work. 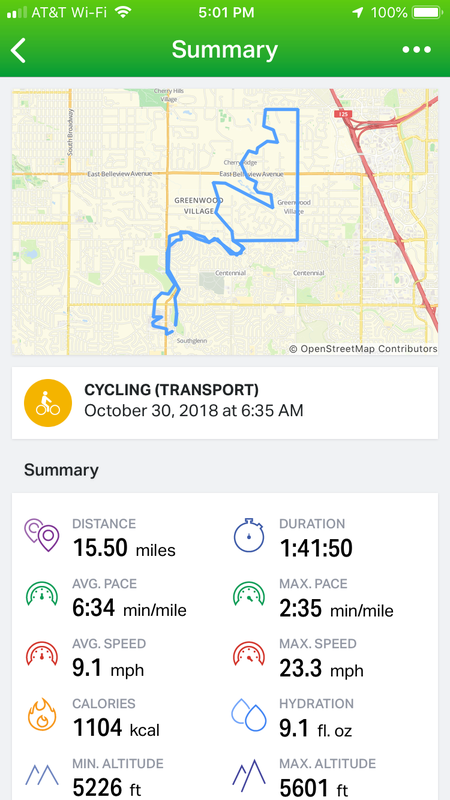 I broke a pretty major streak this morning. I DIDN'T listen to Twenty One Pilot's new album for the first time in quite awhile, and instead rotated in a little of one of my favorite bands The Avett Brothers. That new Twenty One Pilots album "Trench" is a beaut, though. I have yet to get really tired of it despite having it on nearly non-stop for the past several weeks. It's pretty darn great. Mood: Loving trails, not so much streets. 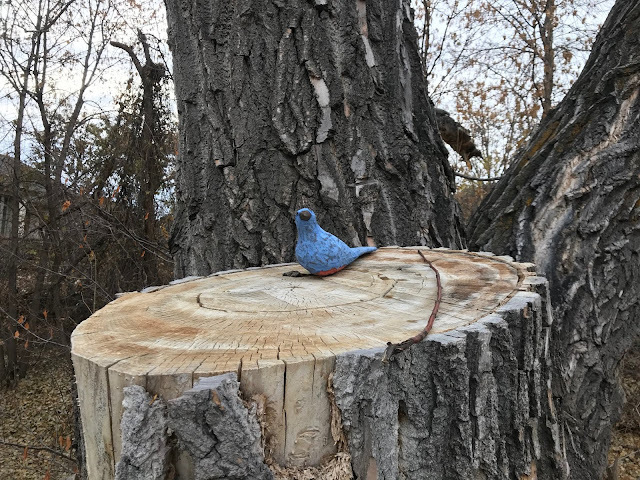 Someone placed a blue clay bird on this giant stump along the Highline Canal Trail. No idea why, but it does make the stump much more interesting. 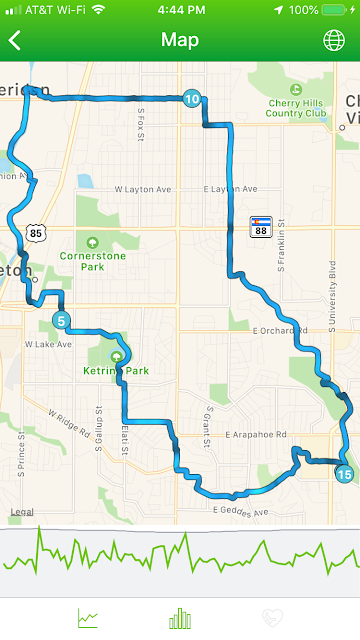 This ride illustrates something very clearly, the first half I was on the Highline Canal Trail, which is much less direct (as evidenced by the wavy lines on the map), but it is much more flat and easy to ride. 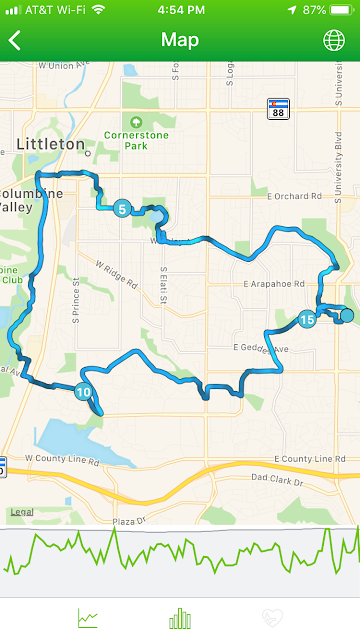 The second half of the ride I rode down Holly and Belleview, which is much more direct (hence the straight lines on the map), but MUCH more difficult, as it requires going up and down some outrageous hills. I was happy when I got back to the Highline Canal Trail to finish up as it made things so much less stressful on my legs.